An unknown catastrophic event is occuring in the Northeast of the United States. It strikes without warning and effects anyone, causing disasterous happenings. In the midst of all the panic, a New York High School teacher and his distant wife set out to try and escape the unkown diaster before it happens to them. M. Night Shyamalan directs his sixth major production film, 'The Happening,' which feels more like a B-SciFi throwback or a Stephen King novel than a Shyamalan production. The story itself is good and feels very much similar to the likes of old films like, 'The Mist' and 'The Fog.' All of the suicides are very brutal and some even made me actually turn away. The problem I had with The Happening was the mood of the film, it was telling a very dark story with huge impact, but it was done in a very campy way. I don't know if Shyamalan intended for the film to have zany acting and a campy feel, but it took away from the intriguing disaster. All of the acting throughout the film feels much like the acting in old SciFi movies of 60's and 70's with very over-the-top performances. Mark Wahlberg, as the high school science teacher Elliot Moore, was absolutely ridiculous. His performance was so badly acted, you hoped it was intended. Wahlberg has always been a solid actor and has had some very strong roles including 'Boogie Nights,' "I Heart Huckabees,' 'The Basketball Diaries,' 'Perfect Storm,' and "Four Brothers.' So it was very unexpected to see him hamming it up in the film. There were scenes in particular where he is suppose to be totally crushed and instead his acting feels like a young drama student who isn't cut out for acting. I let his over-the-top acting go, thinking it was inteded, which made the role much easier to like, rather than hate. Zoey Deschanel who plays Elliot Moore's wife, Alma Moore, is seeming to become type-casted. Deschanel has too often played the light-hearted, some-what air headed, and not so sure of herself character (i.e. Elf, Tin Man, Surf's Up, Winter Passing, and Hitchiker's Guide to the Galaxy) and here again in 'The Happening,' she comes off very dense. Deschanel's performance feels childlike throughout and like Wahlberg, you really hope it is intentional. Unfortunately for Wahlberg and Deschanel, the result of their acting made the viewer completely unconnected with their characters and ultimately did not have interest if they lived or died. M. Night Shyamalan is definately a "hit or miss" director whose films seem to be gone over with a fine tooth comb. Ever since, 'The Sixth Sense' Shyamalan has built a hype around him, that has made his film making process a difficult one. He is highly scrutinized in all of his ventures and has been overly bad-mouthed with his last two efforts, the other being, 'Lady in the Water.' 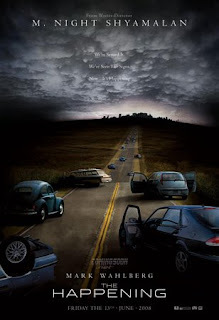 The Happening while is definately not his best work, shines above other films like 'Signs' and 'The Village.' I for one, am over the "hype" surronding Shyamaln's reveals in all of his films. His best work to date remains, 'Unbreakable' which had no reveal and was a very well done hero-like film. Shyamalan is definately a polarizing director who I will continue to enjoy watching his upcoming films, reveal or not. Finally, The Happening is a disaster film that is intense and intriguing, but loses it's overall likability with extremely sappy acting. Shyamalan does a good job with establishing his "reveal" early on in the film, but his ability to keep the viewers attention seems lacking in the second and third acts. The Happening has some brutal scenes that have the signature Shyamalan feel, but with too few of them and bad acting throughout, the overall film is lackluster and very forgetable. This is a great cable movie that I coud watch numerous times, with nothing else of value on to watch.